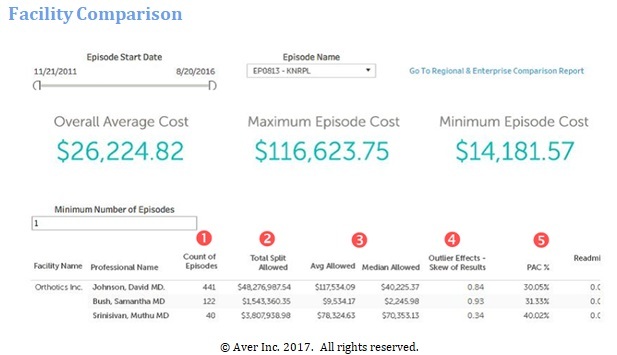 By using historic data to model the underlying, fee-for-service activity in the context of episodes of care, Aver’s Episode Snapshot tool helps payers “see” fee-for-service activity through a bundled payment lens. Our bundle opportunity analysis tool/service identifies both the episodes of care with the greatest opportunities to improve quality and reduce cost and the providers with whom payers should partner to achieve these goals. Making a final determination regarding which providers to approach about a bundled payment contract is truly an art, but there is a good bit of science supporting it. In this post, we’ll explore both elements. Even before a payer reviews the bundle opportunity analysis, they usually have a sense of the providers with whom they wish to partner. This is one of the “art” elements of this process, and it is based on the relationships between payers and providers. Payers are aware of providers who are succeeding under other bundled payment programs and looking for opportunities to expand this type of revenue stream. Aver’s analysis helps payers determine whether their “short list” of providers actually fits the needs of the episodes of care they are interested in pursuing and whether the downstream providers can deliver on cost and quality and will be agreeable to a bundled payment contract. "Aver’s analysis helps payers determine whether their “short list” of providers actually fits the needs of the episodes of care they are interested in pursuing and whether the downstream providers can deliver on cost and quality and will be agreeable to a bundled payment contract." In addition to providing summary information about particular episodes of care across the enterprise, Episode Snapshot offers payers a comparison of both provider and facility performance on a particular episode as they begin to identify potential provider partners. Summary metrics illustrate the average, minimum, and maximum cost of a particular episode of care across all providers. Within an episode type, the facility comparison report offers episode comparison details for the facility, overall, and for all provider groups that perform episodes at that facility. Similarly, the provider group comparison breaks down episode details by the facility at which the episode was performed. Like all Episode Snapshot reports, the facility and provider group comparisons may easily be customized to reflect client priorities, such as lines of business or geographic areas. First, the report identifies the number of episodes performed at that facility during the timeframe selected to give payers a sense of that facility’s or group’s volume (❶). Just as when a payer looks for high volume when selecting episodes of care, so, too, should the payer look for facility or provider partners with high episode volume. In both instances, high volume allows for the creation of economies of scale and legitimate savings opportunities. Second is the total allowed amount, for Bundled Payments for Care Improvement (BPCI) bundles, or total split allowed, for PROMETHEUS bundles (❷). This is a measure of the total amount of money the facility or provider group received for performing a particular episode. The terminology is different depending on whether a payer is viewing their data using BPCI or PROMETHEUS episode definitions. While BPCI attributes the entirety of a claim to one episode, PROMETHEUS episode logic allows claims for a patient that fit into multiple episodes to be split across those episodes. In this way, the total split allowed actually adds up to the total amount spent on that patient. 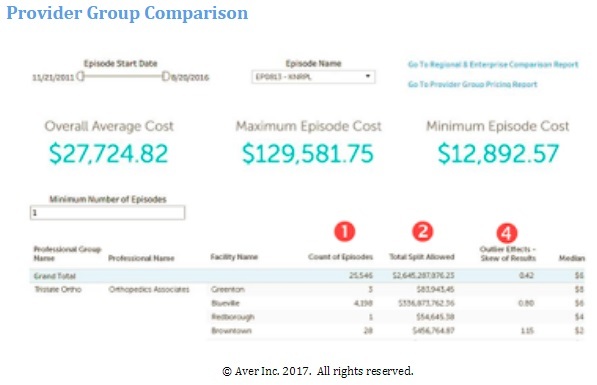 Combined with the episode count, the total allowed amount or total split allowed helps a payer to assess a facility’s or provider group’s episode volume. Third, median and average split allowed (or allowed amount for BPCI) provide a better sense of the typical episode cost for that facility or provider (❸). Here is where payers can start to see which facilities or groups are outliers in terms of costs and think about whether opportunities may exist to help those providers standardize their care pathways to improve quality and reduce costs. Fourth, our reports offer a number of measures of cost variation to help payers further explore opportunities for care pathway standardization within a facility or provider group, including interquartile range and standard deviation, which can be included at client preference (❹). We’ve also been using a measure of skew to further help clients understand how episode costs for a particular facility or provider group are distributed. A normal distribution has a skew of zero. A skew score above zero indicates there are outliers to the right of the median (high-cost outliers) which are pulling the average cost up. Conversely, a skew score below zero indicates a left-tailed distribution (low-cost outliers) which are pulling the average cost down. Fifth, we typically include claims and cost information that may be used as a proxy for care quality (❺). For example, PROMETHEUS episode definitions identify spending on potentially avoidable complications, and our reporting can display this in dollars or as a percentage of the average split allowed. We can also include the facility’s or provider group’s readmission rate for a particular episode. Finally, we are able to add filters so that payers can review all of this data by region, such as county or metropolitan statistical area, or by state to help in their contracting efforts, so long as the payer provides us that data from the start. This allows us to conduct peer-to-peer provider analyses in specific geographic areas, helping to illustrate for facilities or provider groups how their competition is performing and what they need to do to remain competitive in the marketplace. By highlighting the upside of accepting a bundled payment contract using this data, Aver can help payers move contracting conversations forward. But before contracting conversations begin, payers must identify the facilities and provider groups it wishes to approach. With all this science as our foundation, we can return to the art of this process to determine whether the providers a payer identified on its initial “short list” are the right providers to participate in a bundled payment for a particular episode of care. From here, Aver is as involved in contract conversations with providers as our payer client would like us to be. We can create custom reports and draft talking points for conversations with specific facilities or provider groups and we can also lead those conversations. While the payer may be our client, providers tend to see Aver as a third party because we don’t have longstanding relationships with either party in the contract negotiations. This allows Aver to let the data lead in order to highlight opportunities for both payers and providers to succeed in a bundled payment environment. By using data, or “science,” to view fee-for-service activity through a bundled payment lens, Aver supports payers in the “art” of identifying the right provider partners for their bundled payment program. With this information in hand, the next steps in Aver’s bridge from volume to value are configuring episodes and establishing contracts and pricing. Learn more about these and other steps in operationalizing value-based contracts on our blog.